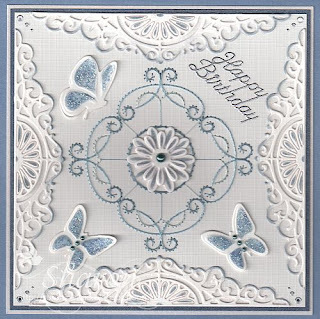 I have combined Ann's Paper Art a435 with Sue Wilson CED2203. the 3D Embroidery Sheet #1 "Rose Glow". It's been a very hot and muggy few days, the rain has finally arrived in QLD. Hopefully it will disappear soon and we will have lot's of sunshine again. 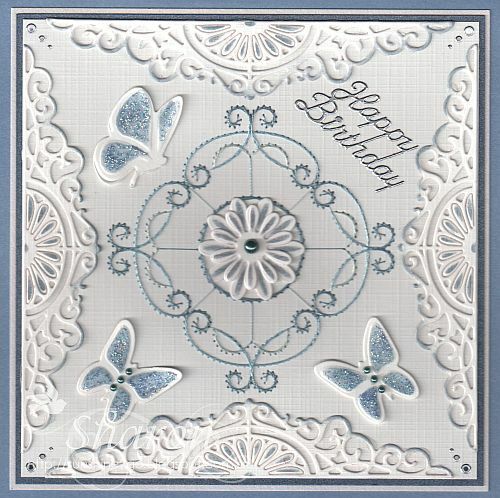 A beautiful new pattern by Ann's Paper Art, the pattern is a698. You can also purchase the pattern and 3D sheet together. The cute image is by Nellie Snellen NEVI055. The outer circle was die-cut with Ann's Paper Art round stencil AND004. 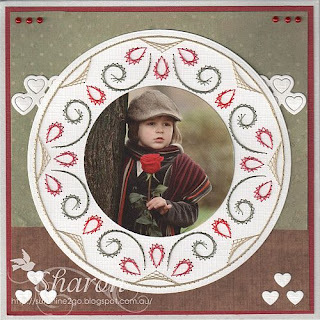 embossing folder and die cut hearts. Backing paper is by Studio Light. Today is Sue's Birthday and this is the card that I created for her. available in Card Embroidery book #1. Threads are Mettler Polysheen 3851, 3951, 3971. Sue's favourite colour is blue!! 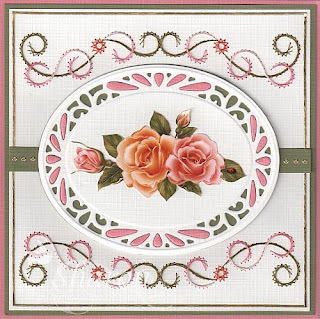 The die around the edge is by Sue Wilson called Charming Lace CED6404. Butterflies in Flight CED1611, I added blue Stickles on the wings. Flower in the centre of the stitching is by Joy! Crafts 6002/0024. I have added pearls, hobbydots and Weathered Wood distress ink. together along with the beautiful patterns by Ann's Paper Art. Wishing you all a wonderful and crafty 2016.